Keratos - European association on ocular surface diseases and lachrymal dysfunctions. Preserve our Eyes, not our Drops! A more complete version of the website is currently available in French. Since October the 4th, 2007, Sclerals lenses are now reimbursed in France as a prosthetic device for several indications, including various Ocular Surface Diseases, notably corneal diseases and scarring and a few visual indications as well. This is obviously a great victory for Keratos, and its partners Amalyste and Keratocône, in France. Hopefully, other countries will follow this example. We hope you'll like it. You're welcome to send us your comments, suggestions and corrections. The website is now available and almost complete in both English & French; to reach other countries and languages a short presentation is now available in both Portuguese and Norwegian. Click on the image bellow to visit it. The High Health Authority emitted a favorable opinion on the reimbursement of one type of scleral lenses in France. If you read French then here's the relevant "avis de la CEPP". Keratos has been advocating the reimbursement of scleral lenses for years but for the first time we were able to present our plea to a panel of experts of the High Health Authority. Dry eye and corneal diseases sufferers are now welcome in public places except in restaurants, bars where the new decree will only be applicable in January 2008. Only then, we may consider to be totally safe to enter a French restaurant. Until then, you may find a few voluntary non-smoking restaurant (particularly in Paris). 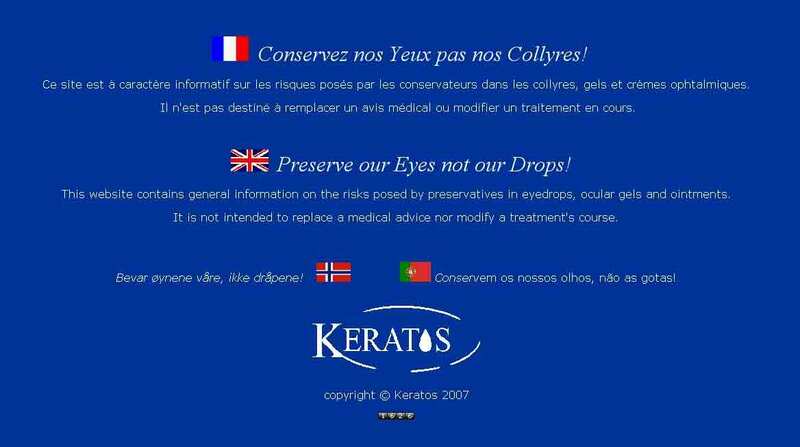 Keratos launched a website on the negative impact of preservatives in eye drops. Preserve our Eyes not our Drops! or this one Preserve our Eyes not our Drops! If you read French, you may join Keratos and receive our newsletter. See the conditions in French at.